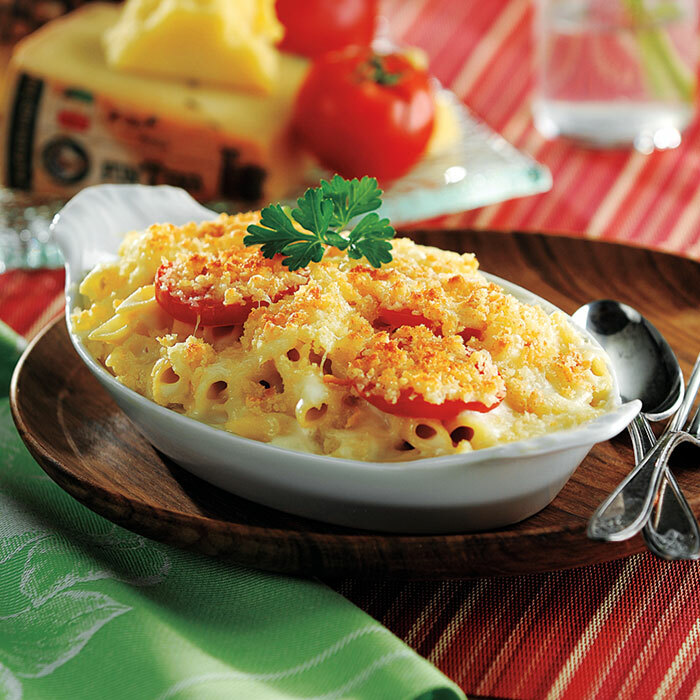 This gourmet mac & cheese is a fresh, flavorful and elegant twist on a comfort food classic! Preheat oven to 375°. Heat large covered saucepot of salted water to boiling over high heat. Add pasta and cook as label directs; drain pasta. Meanwhile, in medium microwave-safe bowl, heat 2 tablespoons butter in microwave oven on high 45 seconds or until melted. Add breadcrumbs and Parmesan, and stir until breadcrumbs are moistened. In large saucepot, melt remaining 4 tablespoons butter over medium heat. Whisk in flour and cook 2 minutes, stirring constantly. Stir in milk and heat to boiling over medium-high heat, whisking constantly until mixture is smooth and thickens. Remove saucepot from heat. Stir in cheeses, salt and pepper; fold in pasta until well coated with sauce. Pour pasta mixture into 13 x 9-inch baking dish. Arrange tomatoes in single layer over pasta; sprinkle breadcrumb mixture over tomatoes. Bake 30 to 35 minutes or until edges bubble and top is browned.